iPage is one of the cheapest and low-cost webhosting to start a wordpress website within budget. It offers free domain name, unlimited hosting and email address, site builder, marketing credits, and much more. Are you in search of a cheap web hosting which provides reliability, fast servers, and maximum uptime, aren’t you? In this post, I will be share iPage review which is one of the cheapest hosts on the internet. If you are a newbie in this field, you will end up choosing the wrong one. Trust me! When I first started out as a blogger, I did the same. Being newbies, we believe what they tell us. We forget ourselves in the false promises most of the web hosting providers give. That’s why you should always pay heed to the reviews. Do you know? More than 400 web hosting companies are available out there. And, it’s obviously tedious to choose only one from the list. That’s why I am on a mission to review maximum hosting providers I can, to fetch you an idea to pick one. iPage Review 2019 – Is it Really Cheapest Hosting? iPage started back in 1998, is one of the pioneers in web hosting field which offer the cheapest hosting. Endurance International Group aka EIG bought iPage in 2009 and refurbished the business. If you are familiar with web hosting companies, you know EIG doesn’t have a good track record. But when it comes to some providers like Bluehost, the company does well. 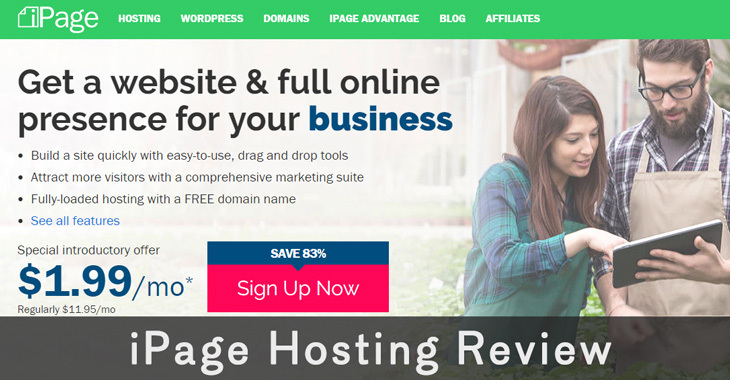 Here in this ipage review, we are going to find out whether it’s the web hosting company you should rely upon or not. First, I want you to explore the features of iPage. Are you ready? Here you go! I have analyzed their service and website thoroughly and, collected the features they offer. You can find them below. What is the prime criterion you consider before buying a web hosting plan? Is it the quality of service?? Then, why don’t you purchase a dedicated server given that it has the best quality? If you ask me the same question, I will say price. I believe it is the same in most people’s cases. There is no point in presenting some expensive services no matter how much quality it has. What we need are affordable web hosting solutions. Guess what? iPage has got your back. Their web hosting services start at $1.99 per month. Yeah, you heard it right. In order to buy a shared hosting plan from a reputed provider like iPage, you have to spend a monthly price under $2. I have researched a lot for a much cheaper hosting provider, But I became disappointed by not getting a reputable solution to compete with iPage regarding price. Their website says the low cost is the part of a discount period. And, you won’t be able to grab the same if you can’t buy it in time. Are you on a shoestring budget? Do you think you have not enough money to start a self-hosted website? Then, you must buy an iPage shared hosting plan. A top-level domain costs about $10- 15 per year. Have you calculated how much you should pay for the hosting? If you choose to go with iPage shared hosting, the price will be less than $24. For a person who spends $24 for hosting, $15 is a significant amount. Considering your financial situations, you may not be able to arrange additional funds to buy domains. iPage offers a free domain for one year with all their hosting plans. The other hosting providers who give free domains integrate this feature with shared hosting only. But our provider here gives away domain for free with every package. You can choose any domain extension you want. Though .com is the most popular and acclaimed extension, they give you the ability to choose any one among the lot. As you get a free domain, you don’t have to switch between different browser tabs to manage services for your websites. Having domain and hosting plan with separate companies could irritate sometime. After the promo period is over on completing a year, you have to renew the domain for standard costs. Given that a year is more than enough for a website to earn the profit, you won’t find it difficult to pay the bill. Truth be told; you don’t have to worry whether the disk space is unlimited or not. An intermediate blog doesn’t need more than 20 GB to host all the content. If your site is a media based one, you will require more space to host the files. Most of us look out for unlimited disk space when we buy a web hosting plan. As I said earlier, it is your liability to ensure ample storage to host your data, being a website owner deals with media files. iPage offers unlimited storage space and, you can host all your files without any issues there. Are you happy? Now, what is scalable bandwidth? Let me start by explaining what bandwidth is. It is the amount of data flows between your website and the rest of the internet. A decent or unlimited bandwidth is needed to ensure the smooth user experience. iPage has a customer-friendly scalable bandwidth policy. They serve about 99.5% of their customer with the bandwidth their sites need. The problem arises when a website uses one heck of the bandwidth. When this happens in shared hosting, the excessive bandwidth usage will affect the rest of the sites hosted on the same server. That’s why iPage doesn’t offer completely unlimited bandwidth but a scalable one. You can’t register unlimited free domains with iPage. But they allow you to host unlimited domains and subdomains. During the initial time, we don’t have money to purchase separate plans to host our websites. And, the scene becomes even worse when we realize the hosting account we purchased doesn’t support multiple domains. That points out to the need of checking all the specifications of a hosting plan before hitting the buy button. iPage users don’t have this issue because the company allows unlimited domain hosting. You can add as many domain names as you want to the dashboard of a single hosting account. But make sure those shouldn’t steal a lot of bandwidth from the server. Professional email addresses have become a need of today. Custom (professional) emails fetch the best response rate than a usual email like [email protected] When you use a business address to send an email, the ID itself speaks in favor of you. iPage gives you a feature to setup unlimited custom emails. You may think that the unlimited label isn’t needed here, right? But you will regret if it isn’t available because as the website grows, you have to hire a lot of people for writing, SEO, link building, etc. You must give each of them dedicated email addresses correspond to your website. If you want to control your site as an advanced webmaster, you must grab the access to manage all your files on your website. For a WordPress user, you may sometimes have to create HTACCESS file manually and upload it to the server. Moreover, the manual data access becomes essential when you face difficulties in uploading an image, installing a plugin or theme. Some cheap hosting providers don’t give file manager and FTP access. And, that would make your life difficult as a blogger. iPage gives you both file and FTP manager using which, you can manually take control over your files. It is possible to upload new files and modify or delete the existing ones as well. Are you a blogger? Then, you know what redirection means, don’t you? Setting up redirection for a site leads the domain to another one. In Search Engine Optimization aka SEO field, redirection is broadly used to pass the link juice of a website to a new one. iPage has an in-house URL redirection tool and, you don’t have to use any scripts to do the same for it. Just open the tool. Then, insert the target URL. That’s it. Have you ever thought how much Amazon or eBay make per month? I am sure that your eyes will pop out when you get to read the exact figures. You can also create successful online stores if you work smart. iPage provides you with many e-commerce features to make you the best merchant ever. You can create a free online store like a walk in the park with iPage hosting. You may wonder how you will accept payments, right? iPage has a seamless PayPal integration that allows you to show payment gateways and receives funds effortlessly. A payment gateway is not the only thing an online store needed, is it? You must have an impressive design that allures your audience to buy the products. The following are the different types of e-commerce website creators iPage has up in its sleeves. The enticing option is the availability of a one-click installer. Once the installation finishes, you will be able to design everything from a drag and drop e-commerce site builder without any problems. Can you remember what I said at the beginning of this ipage review? Being a newbie, you, I or anyone end up choosing the wrong web host. We won’t notice their lack of quality at first because of the very few visitors we get. As our websites grow regarding traffic and revenue, it starts exhausting more bandwidth. There the hosting provider shows its real color. You will face downtimes often; you will get 404 error pages frequently, and your visitors complain about the slow loading nature of your website. At this time, you realize you have made the wrong choice. But wait! Is there a way to solve the issue? Yeah, I swear there is! The only method to save your hard earned money and effort is to change the web host. Of course, it is a geeky process that you must not do it without the help of a person who has expertise in the process. If you pick iPage as your next web host, they will give you free assistance to transfer your website to their server. All you have to do is purchase one of their hosting plans and request for migration. They will finish the process in no time without any loss in your readership, traffic, link juice or SERP positions. It is hard for a new website to grab the attention of people and search engines. That’s why established companies use paid promotion methods as an effortless way. Have you ever heard of Adwords? It is the platform created by Google for the business owners to display their ads via Adsense. Once you create a highly optimized ad campaign, you will be able to pull a huge number of clicks to your website. As a starting out internet marketer, you may not want to do it because Adwords needs money. Don’t worry! iPage gives you $100 free credits for the initial promotion of your project. You can use it wisely to make your site popular. They also provide $100 Bing credits as well. As a cherry on the cake, you will get a toll-free number. But you must be a US native to get all these. Still, they have an international offer; that’s a free Yellowpages.com listing. The free marketing guides make your job easier by walking you through each step needed. Web hosting needs some geeky knowledge to get things done in the correct way. As a newbie, you may make some mistakes. That’s why a responsive customer care team is inevitable for a hosting provider. iPage has a 24×7 customer support system to help you get rid of any hosting related issues. Unlike most of the other vendors, they have telephonic support as well. You can call them whenever you want and, solve your doubts and problems right away. The live chat box on their website is always there too. Whenever you read an iPage review, you will find the effectiveness of their customer support everywhere. Shared hosting is not the only service they provide. They have got domain names registration service, dedicated servers, WordPress hosting and, VPS in their hamper. The higher the package, the greater the cost will be. If you are skeptical about spending a significant amount to buy a service from iPage, you shouldn’t! Their money back period lasting a month helps you get the cash back. So, if you don’t find them useful as they claim on the website, just ask for the refund and save your investment. In case you face any service issue, you can ask the customer care team to solve it for you. Then, everything works fine for sure. Live technical support will try their best to fix the issues. Cloud storage is your dedicated space on the web to save your important files. It works as a backup medium that you can access from anywhere around the globe. One of the major cons of most of the cloud services is the cost itself. Here, iPage gives you yet another reason to be excited about their service with free 1 GB cloud storage from JustCloud. JustCloud’s mobile app helps you manage all the files on-the-go. You can sync the data with multiple computers and share with your friends as well. Though it’s not the end of their features, I want to finish the section here and invite your attention to their web hosting plans and prices. You will get almost all the services needed for a website from iPage. The following are those. Most probably, this type is the most selling hosting for any provider. iPage doesn’t make things complicated with many plans. You get only one here. Yeah, iPage has only one shared hosting plan starting from $1.99 per month. As I said earlier, you will get a free domain (worth $14.99 o iPage) for free. All the features I mentioned above will accompany this plan. 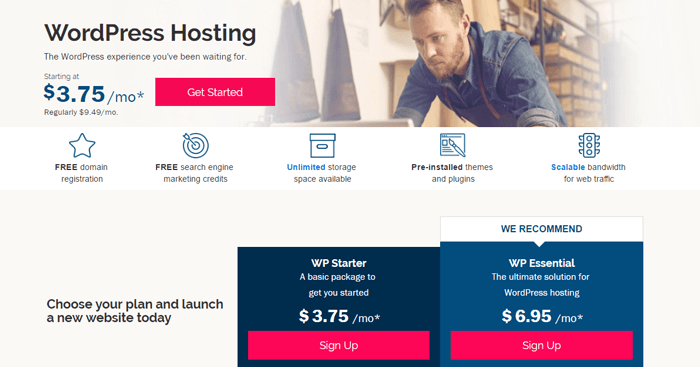 If you want to start a WordPress website, you should buy a WP hosting plan on with any provider because of the convenience, pre-installed items and auto updates it brings. iPage has two different plans under WordPress hosting. (Of course, it’s also shared hosting; but optimized for the best performance with WP). You have to spend $3.75 per month to purchase this plan. They provide pre-installed themes, plugins and customized control panel for easy management of your website. Don’t expect a control panel like cPanel. What you get here is a dashboard or one-stop place that presents all your WP sites at one space. The superior plan in the category of WordPress hosting, WP Essential gives you the features of a WP Starter account along with a deluxe security bundle and SSD level site speed. The support for the former plan is standard whereas what you get here is support from WP experts who have the capability to solve all your WordPress related issues. You need to spend $6.95 per month to host a website with this plan. In every web hosting review, I explained about VPS hosting. It will become a cliché if I do the same here. Maybe, you know what a VPS is. Simply, a VPS is an isolated slice of a server, which has dedicated resources. It’s cheaper than dedicated servers but costlier than shared. If you want to know more about it, visit this page: Web Hosting Guide, I have shared a detailed article on this topic. Anyway, There are three different VPS plans that iPage has. With Basic VPS package, you get a one core CPU, 1 GB RAM, and one dedicated IP address. You can manage an intermediate website quite well using 40 GB storage. The bandwidth they provide with this plan is 1 TB. You need to spend $19.99 per month. If you think 40 GB space and 1 TB bandwidth are not enough for your website, you should pick this one up. Both the features are raised to 90 GB and 3 TB here. They have doubled the memory as well. Instead of one core CPU and 1 IP, you get two cores and 2 IPs. The monthly expense is $47.99. This is their ultimate VPS plan. Everything has been elated to the maximum here. You get a 4 core CPU, 8 GB RAM, 120 GB storage, and 4 TB of bandwidth. The number of IP addresses remains the same, though. You should spend $79.99 per month. All their VPS plans include cPanel. Moreover, you can get a 20% discount for the first term. Is a VPS not enough for your website? Well then, dedicated server hosting should be your choice. Due to the supreme level of control and unshared ambiance, your website will not go down even during a traffic outburst. They have three plans under dedicated hosting. The server you get on buying this plan has 4 GB RAM, 500 GB storage and 5 TB of bandwidth. You also get three dedicated IP addresses. The cost is $119.99 per month. Everything except the number of IP addresses has been doubled up here. They provide four IP addresses instead of three here. Monthly price is $151.99. The amount of RAM has been raised all the way up to 16 GB. The storage remains the same as the above plan (1000 GB). You get 15 TB of bandwidth and, 5 IP addresses. One should spend $191.99 per month to purchase this plan. As in the VPS plan, you can pull off a 20% discount for the first term here too. Along with the hosting services, you can register domain names too. Of course, you get a free domain with every plan. In case you need extra, iPage gets you the comfort of managing all of them at one place. There are upto 321 domain extensions available to choose your website name. iPage offering impressive hosting benefits, features, and packages at a reasonable price. Here are some pros and cons I found after using it for a year. While discussing hosting reviews and not considering servers performance is completely inappropriate. That is why before sharing any review to test the web hosting quality I use a couple of services such as Pingdom and GTMetrix for speed testing, Load Impact to analyze how much users your website could handle and uptime robot to monitor up/down times. I had tested the site many times to find the exact result, why? Because sometimes server variations could occur and it’s necessary to check multiple times. After activating W3 Total Cache plugin, I got impressive results and shocked, you’ll too. Is it really possible to get such an excellent loading speed from a cheap hosting service? Take a look at the below image. 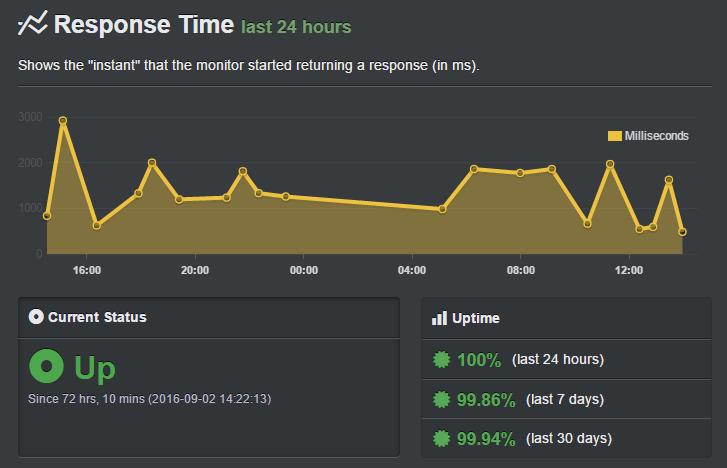 Uptime Robot is the best free source to monitor website uptime, here is the outcome of the last 15 days. However, I am continuously monitoring to share more accurate results. All the results and statists are outstanding which apparently mentioned that iPage is the best cheapest wordpress hosting service. As you can see results, isn’t it a perfect host to buy hosting plans within budget? It’s your turn now. If you’re don’t have enough money to buy expensive hosting and want to create a website then feel free to go for iPage web hosting. You get what you pay, and the most important thing is your dream of starting a website will become true at the lowest price. I have presented you with an unbiased iPage review with real facts. Maybe, you are still hesitant to purchase their service. But don’t worry! Remember? They have a 30 days money back guarantee. So, there’s nothing to lose by testing their service for a few days. If you are ready, I got to tell you that you will never call off the plan.